I woke up early on Friday to the sound of the leaves rustling outside the window. I grabbed my phone and checked the local NOAA wind meter and it was already gusting to the high 20s. It was 5:45 AM, just starting to get light out, and time to get moving. The surf smoothed out as the morning went on. in the week I checked the forecast and it looked like a big North wind was going to line up well with my 4th of July trip to Manistee. If you’ve ever had the chance to ride a north wind in Manistee then you’ll know why I was so excited. Anything over 20 knots creates some really clean waves and the wind is almost always steady. My parents live in Manistee so my family and I go up there often. My father got into stand up paddle boarding a few years ago so we enjoy hitting the local spots when the wind is right. Lately when I’ve been in town it’s been all southerly winds which can be a lot of fun too but there’s no wave action unless you head south to Ludington ornorth to Frankfort. First time I’ve tried my new 8m Ocean Rodeo razor and I was pretty impressed. By the time we arrived at the beach it was blowing in the mid 20 knot range near shore and close to 30 knots near the elbow. I bought some new Ocean Rodeo gear this year and this was my first chance I’ve had to try the 8m Razor. The scenary in Manistee is hard to beat this time of year. I pumped up my kite, ran the lines, launched, and made my way towards the water. I was nicely powered and the 8m was very agile. The water was warm and the waves were chest high rollers. 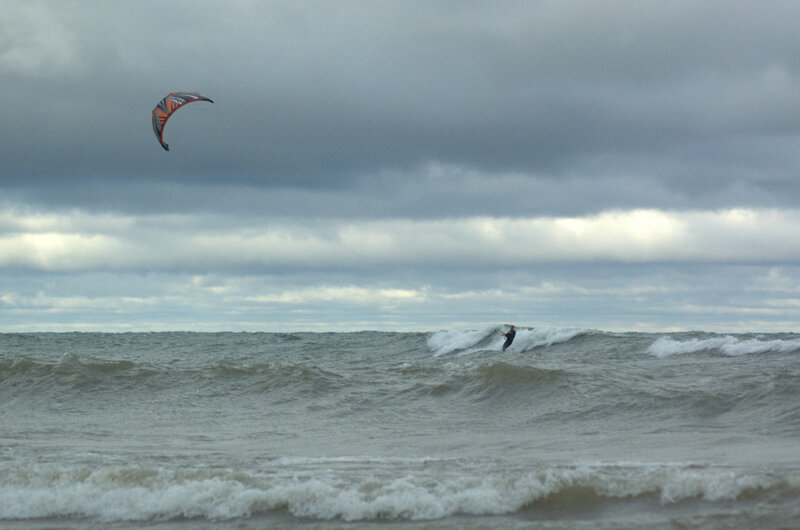 What I find unique about kiteboarding in Manistee versus other setups is how smooth the water is between peaks. A true north is side-on in Manistee so when you are headed towards shore you can easily pick up some speed between waves for boosting or drift down wind to catch some surf. I really liked the 8M Razor. It turns on a dime and boosts well. In comparison to a Switchblade it jumps just as high but has more glide. It’s not a wave kite but drifts fairly well and I only had one instance where my lines went totally slack and it looked like my kite was gonna hit the water before recovering at the last second. Yeah it was good until early afternoon. Would be great to get a pan tilt zoom cam at st 1st sometime so like u said we can get a better view of the surf. Rode in Grand Haven that afternoon, but it wasn’t as good as what you had up north. I wish we could learn more from the wave cams too. Jeff and I went down to the beach again that afternoon. Even looking at the waves from the parking lot we could not be sure that there were rides. A couple of surfers (one from Grand Rapids and another from Montague) gave us a very enthusiastic thumbs up. So I took my board out and caught some good rides, although I think I missed the peak. There were three other surfers out at the same time. By the way, I have had the same experience in Frankfort. One day last year I looked at the waves from the parking lot. Not convinced that I would get any rides, I took the board to the water and had a great time with some modest clean waves. Last Tuesday morning I sneaked away to catch a few rides at First Street in Manistee that were some of the best I have had anywhere (not real big, but fun). Then later in the day, about 4:00 PM the numbers from First Street NOAA looked like it would be even better. Chop and no curl. I tried it anyway. No rides except some tiny ones near the pier.